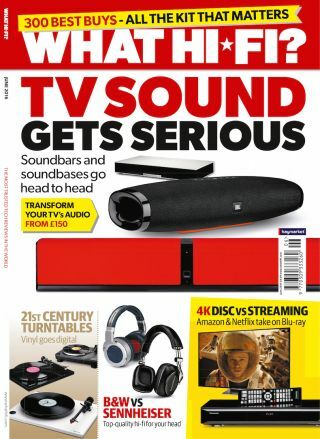 New issue: Soundbar and turntable tests, Sony HDR TV, 4K showdown and more | What Hi-Fi? This month sees us pitch six soundbars against each other in three price brackets, two new digital-ready record decks against the Rega RP1 and a flamboyant pair of Sennheiser over-ears take on the B&W P7s. All this and more makes the June 2016 issue of What Hi-Fi? one not to be missed. With a range of soundbars and soundbases on offer, it’s easier than ever to boost your TV's sound. We’ve taken four newcomers and two Award-winners across three price brackets to find out which ones deserve a place beneath your TV. Vinyl might be here to stay, but it doesn’t come without its inconveniences, including the ability to play your LPs on the go. But that’s where a USB output comes in handy. Convert your record collection to digital for the best of both worlds. We place new models from Audio Technica and Sonos accessory specialist Flexson against the non-USB Rega RP1 Performance Pack. Can digital-ready trump analogue-only? Ultra HD Blu-ray discs are still a fledgling format, while 4K streaming has been around for a few years. Streaming is arguably more convenient, but is there a significant loss of quality? We take an in-depth look at both 4K sources to decide which is best… and we haven’t forgotten about HD Blu-ray either. Our desire for better sound from our digital music collections shows no signs of waning, so a decent DAC is essential. Although a Chord Mojo can nearly always be found in the What Hi-Fi? test rooms, we've swapped it our for Arcam's second-generation irDAC to see which one deserves your money. Bowers & Wilkins knows how to make great sounding headphones and the P7s are a testament to that. The company's most expensive pair to date, they are a benchmark for the sort of sound and build quality we expect from a £300+ pair of cans. Sennheiser's new HD 630VB are slightly more expensive, but come with a variable bass control. Can the 70-year-old headphone veteran dethrone the King? Our Insider section this month celebrates Tannoy’s 90th birthday by digging deep into the company’s archives and looking at its illustrious history. Following the news that the firm's Coatbridge factory is set to close, we also ask the question: where is the company heading in the future? In our Temptations section this month we feature two five-star products. Luxman’s C-700u/M-700u preamp/power amp combination and another pair of Sennheiser headphones, the HD 800 S, described as “the most comfortable headphones we’ve tried”. And no issue of What Hi-Fi? would be complete without a packed First Tests section, which this month features Sony’s flagship 4K HDR TV, one of the best we’ve seen this year, and the Marantz NA6005, the network streaming brother of the Award-winning PM6005 and CD6005. There’s also a fantastic pair of budget Tannoy floorstanders and our verdict on the Samsung Galaxy S7 smartphone. Don’t forget, you can download the digital edition of the magazine directly to your smartphone or tablet at any time. Happy reading!